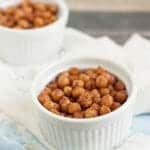 Simple Cinnamon Honey Roasted Garbanzo Beans are a delicious and nutritious snack idea perfect anytime. Several years ago blogger challenges were all the thing and I used to host one myself called the Eating the Alphabet Challenge. It’s then that I first shared my recipe for Cinnamon Honey Roasted Garbanzo Beans. The challenge featured fruits, vegetables or beans each month we’d share a recipe that started with a different letter each month. I no longer host the challenge but many of the recipes I shared back then are worth resharing. So I’ve updated the photos and text here to reshare this recipe for you all–it may be totally new to many of you! At the time, over five years ago, I hadn’t really heard of roasting garbanzo beans until my sister-in-law told me how much her kids love roasted garlic garbanzo beans. 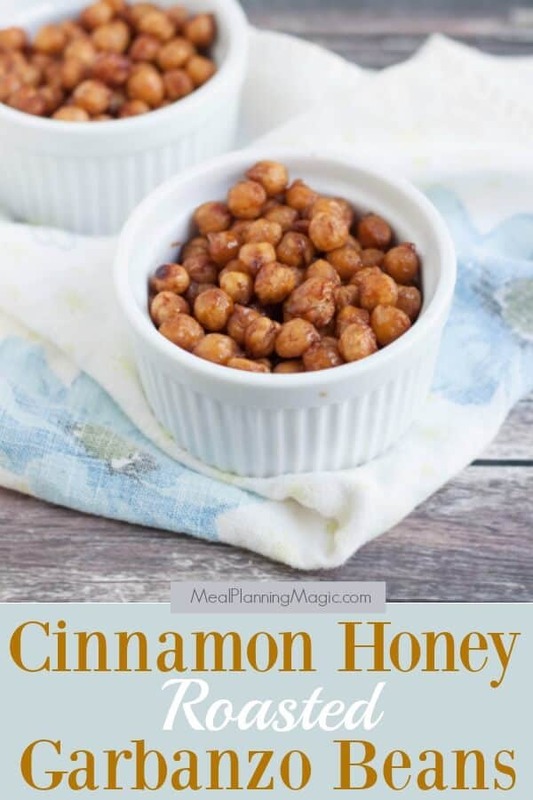 I decided to give a sweet spin on the snack and created this recipe for Cinnamon Honey Roasted Garbanzo Beans. 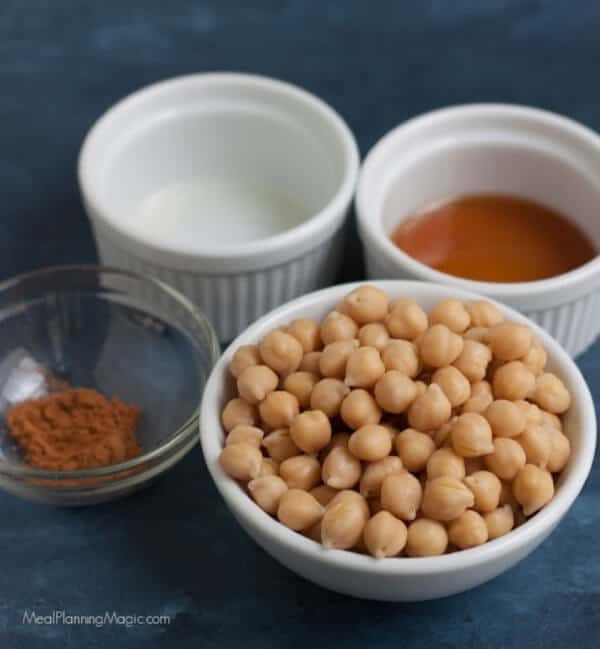 Now you’ve probably seen many other recipes for roasted garbanzo beans but this is still one of my favorites! This snack is SO simple to make and for those that are nut-free, a great alternative to the crunchiness that snacking on nuts can provide. For me, it took a little practice to get it just right on the crunchiness without them getting too hard. When you’re done, just store them in an airtight container until you’re ready for snacking. This snack makes a great addition to lunch boxes, after-school snacks or for healthy eating on the road. We love using garbanzo beans to make homemade hummus but this is a tasty new way to try them. 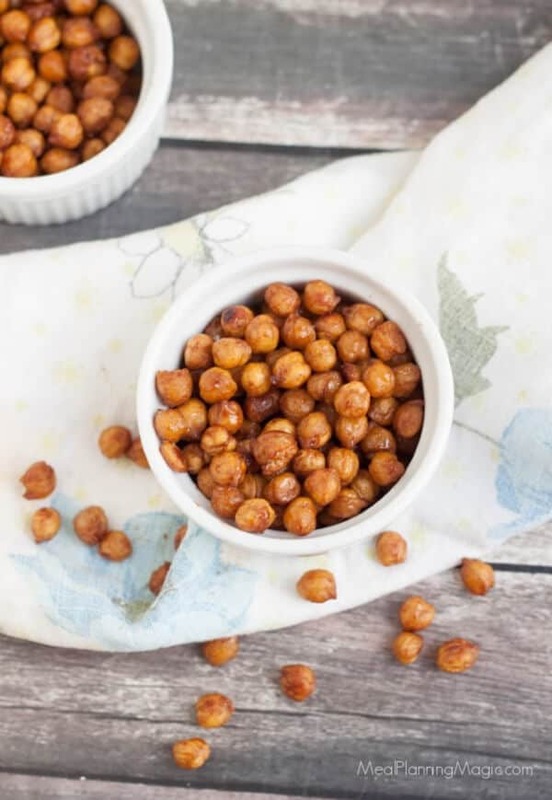 Garbanzo beans, also known as chickpeas, are packed with nutrition making these an even better snack to me! They are a great source of dietary protein and are rich in dietary fiber. One cup of garbanzo beans supplies almost half of the recommended daily allowance of dietary fiber! They’re full of vitamins and minerals too like manganese, folate and iron. I hope you enjoy these Cinnamon Honey Roasted Garbanzo Beans as much as we do! 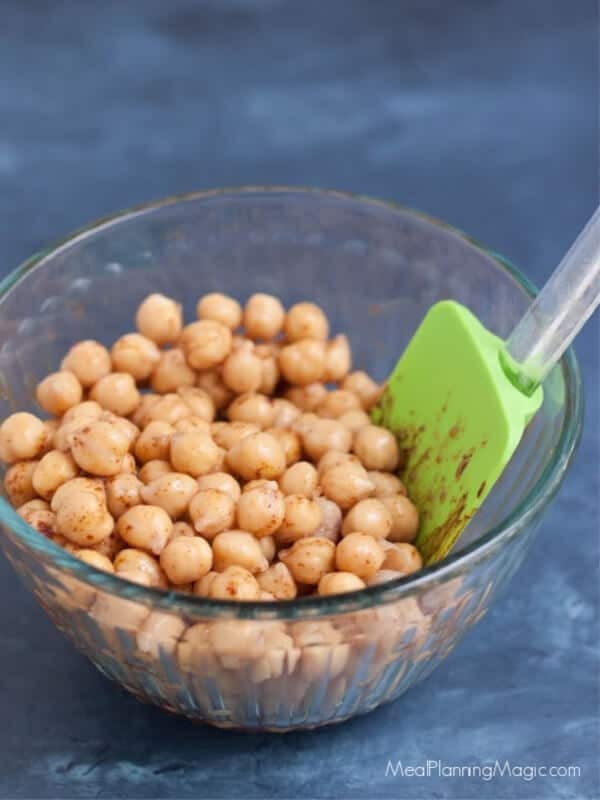 Simple Cinnamon Honey Roasted Garbanzo Beans[/timer] are a delicious and nutritious snack idea perfect anytime. Drain and rinse garbanzo beans. Place beans on a towel to dry. You may pat them to dry. Let them air-dry about 15 minutes for extra crunchiness. In a small bowl, add cinnamon and sugar. Whisk together to combine then add oil and mix until blended. It will clump a bit but that’s ok. Add garbanzo beans and stir until beans are evenly coated. 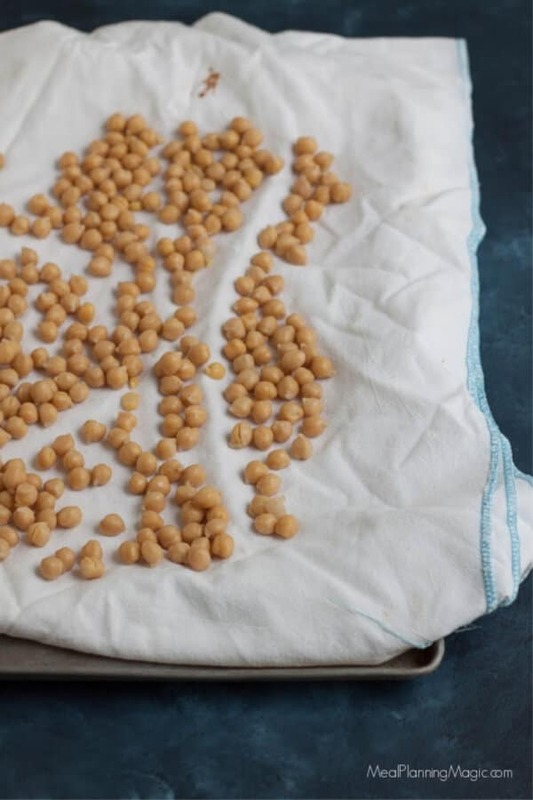 Spread out garbanzo beans on a large baking sheet. Bake for about 35-40 minutes, stirring every 10-15 minutes, until chickpeas are crunchy and no longer soft in the middle. 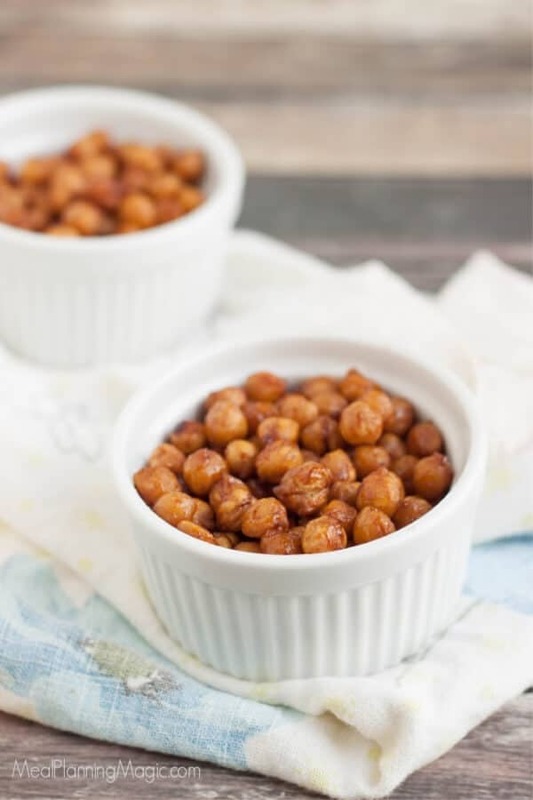 Return hot, roasted chickpeas in a small bowl and coat evenly with honey. Spread garbanzo beans back out on baking sheet and allow to dry. Store in an airtight container at room temperature. lol – Brenda, we did it again! Great minds think alike. 🙂 These are sooo good! Funny! Yes, great minds do think alike. They are such a healthy crunch of sweetness-love them!